Races to begin at 7:00 AM on Saturday, March 30th at the Simmons Center. 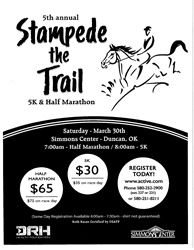 The Stampede the Trail 5K and Half Marathon will be returning to Duncan for it's 5th year on March 30th, 2019. The event, hosted by the Simmons Center and DRH Health Foundation, raises money each year to go towards the local hospital and scholarships. Cost for the Half Marathon is $65 or $75 for race day registration, the Half Marathon will begin at 7:00 AM. Registration cost for the 5K is $30 or $35 on race day, the 5K will begin at 8:00 AM. Both races will begin and end at the Simmons Center. The DRH Health Foundation was "established to help meet the ongoing mission of Duncan Regional Hospital in providing compassionate and exceptional healthcare while improving the community's quality of life." Their events include the annual DRH Gala, Spring Fling, and more, as well as a variety of other opportunities for donors to give back to the community. The Simmons Center is the premiere fitness and convention center in the Stephens County area with a mission of uniting recreation, performing arts and conventions to build a healthier lifestyle for all. Within the recreational facility, they offer a wide variety of fitness classes, as well as a weight and cardio room, 25-meter indoor pool, indoor basketball gyms, and more. The convention center boasts over 10,000 sq foot of meeting space, along with the state of the art, 750-seat theatre for the performing arts. To register contact the Simmons Center at 580-252-2900. For visitor information, please visit http://www.visitduncan.org or call 800-782-7167.